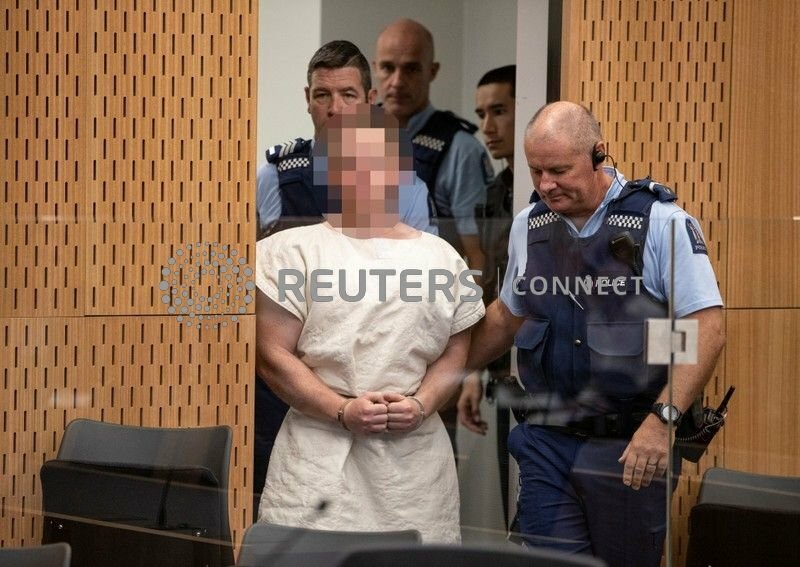 CHRISTCHURCH/WELLINGTON, New Zealand (Reuters) - The main suspect in mass shootings at two New Zealand mosques was charged with one count of murder on Saturday, a day after the attack that killed 49 people and wounded dozens, prompting the prime minister to vow reform of the country's gun laws. Footage of the attack on one of the mosques was broadcast live on Facebook, and a "manifesto" was also posted online that denounced immigrants as "invaders". The video footage showed a man driving to the mosque, entering it and shooting randomly at people inside. Worshippers, possibly dead or wounded, lay on the floor, the video showed. Reuters was unable to confirm the footage's authenticity and police urged people not to view or share it. U.S. President Donald Trump, who condemned the attack as a "horrible massacre", was praised by the accused gunman in a manifesto posted online as "a symbol of renewed white identity and common purpose". "...I can tell you one thing right now, our gun laws will change..."
THIS is a proper response by a government in response to a mass shooting; try to enact new, better laws which might prevent atrocities like this from occurring again. So many feel it's a God given right to possess whatever weapons they wish. How’s that working out in Australia? Seen the news lately? A heinous hate crime of all proportions. At least he wasn't paraded to the media and in court, the Thai way. Barefoot and with leg shackles.. But in this instance maybe he should have been..
Has anyone seen the comments sections on Facebook and on line news? The response has been to say the least astonishing, a mass murder like this is abhorrent and some people are applauding it !. Um, two decades of no mass murders? You can always tell a wannabe by the silly front grip on the AR and the cheap scopes. 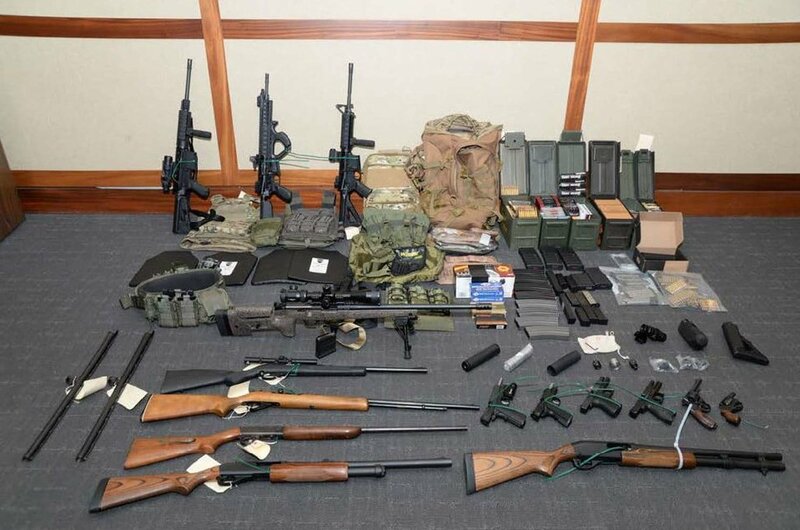 But he has good taste, I see he was planning to wreak havoc on folks with his 1895 Nagant (second from right revolver), a collector piece that was obsolete in 1900. Fun to shoot though. Nice start. At one time I had over 180. ...agreed..if the PM has made that statement; why weren't the gun laws tightened as they were in Australia, post 1996 (Port Arthur Massacre). Any PM/Premier/President/Leader must have a 'finger on the pulse' regarding world terrorism and be constantly adjusting/updating relevant laws accordingly...IMHO. they were “tightened” in 1996, or rather, further tightened in 1996, as the un zud government had previously tightened gun laws following earlier mass shootings. 50 people dead and this woman can think about is eliminating the rights of her own people. Sad, but utterly predictable. These people never change. I lived in NZ for a few years and travelled throughout the country. NZ police do not carry weapons in their day to day duties. There is no need whatsoever for NZ civilians to own semi automatic weapons, large capacity magazines and so on. This mass murder exceeded the number of murders in the last year in NZ (37). it is absolutely correct to ban such weapons for civilian use. 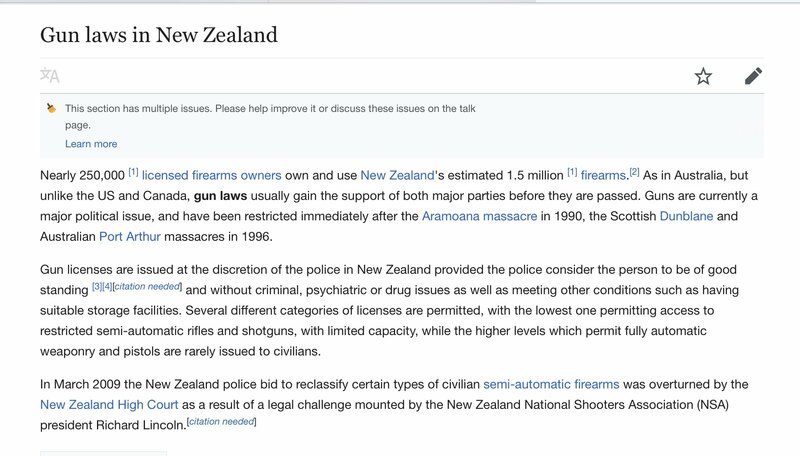 Hopefully the NZ government will implement the same program as Oz for the hand in of existing banned guns when laws are enacted..
...well that's a reassuring read..thanks for that...let's hope other countries follow suit..after the PortArthurMassacre the federal govt had two amnesties and a gun buy back, however a fair per cent hid their already illegal weapons. Terrorists and their supporters are scum, end of story , picking and choosing just makes one part of the problem.